:: in, De Re Cibaria Libri XXII | Omnium ciborum genera, omnium gentium moribus, & usu probata complectentes; Lyon, 1560.
:: in, Observations sur l'Agriculture et le Jardinage, pour servir d'Instruction à ceux qui desireront s'y rendre habiles. Par M. Angran de Rueneuve. Conseiller du Roy en l'Election d'Orleans; Paris, 1712.
:: A nearly unknown, remakably clear, and very sympathetic evocation of what wine, to a counsellor of Louis XIV, was, and was meant to be. :: "M. Paguierre, ancien courtier de vin"
:: This little text, or bilingual pair of texts, is rare, and intriguing for a number of reasons. The first is that there is no earlier publication known to me that describes wine-making in Bordeaux in comparable detail. The second, is that the wine-making it describes is so startlingly different, in several key respects, from anything we would now think of as traditional for that region. :: Parallel texts, in English (1828) and in French (1829). :: The instructions for an approach to wine-making nearly unchanged since the fall of Rome, yet from a text that was both the pioneering agricultural treatise of its era and only the second work of its kind to have been written in any European language for 1000 years. :: The earliest detailed exposition known to me (thanks to Jean-Claude Martin) of the influence of geological factors on the taste of wine, from the most important treatise on architecture to have survived from the ancient world..
:: With further notes on how to build a good architect; and on the miracle of literacy; and on the thought that the measure of education is what saves you after a shipwreck; and finally, on who cares about sports heroes & why so much. :: From Architecture, ou Art de bien bastir, de Marc Vitruue Pollion; Paris, 1547; thus, the first translation into French of Marcus Vitruvius Pollio's De Architectura Libri Decem. :: Pourquoi les Plantes ne seroient-elles pas de véritables Animaux? - or, Why aren't plants, really animals? :: In, Charles-François Tiphaigne de la Roche, Observations Physiques sur l'Agriculture, les Plantes, les Minéraux & Végétaux, &c., [Paris], 1765.
:: Tiphaigne examines whether plants have feelings, concludes that the answer clearly is "yes", and wonders why we have so much trouble conceding this, which of course we still do today. :: By no means a text I've put up on the internet solely to irritate the more self-congratulatory breed of vegetarian - although, of course, it does have that to recommend it - but more because it's a wonderful example of how ideas can be savored as completely as wine; & this by the man who, by a similar savoring of ideas, foresaw photography more than 79 years before its invention was announced. :: Manuscript, apparently unpublished, French, c. 1690.
:: A sampling from a remarkable speculation on existence, including chapters on the origins of the universe, the nature of light, of aroma and taste, and the nature of nature itself; by an unknown 17th-century scientist & philosopher of science, very much worth our attention, & clearly unafraid to tackle the larger issues. :: Which is to say, those we dislike to consider, since we cannot answer them ourselves. :: [The following anthology of early texts on the discovery of fermentation as a living process, when first posted in March of this year, significantly lacked an opposing view; that is, it lacked the expression of a position explicitly opposed to the idea that fermentation is the result of microbial life. :: I'm pleased to be able to remedy that lack now with an essentially unknown paper by Jean-Jacques Colin (1784-1865), who worked with Gay-Lussac for many years, then became Professor of Chemistry at St. Cyr and later at Dijon. It is called Nouveau Mémoire sur la Fermentation, was first read before the Académie des Sciences, and was then published separately as a 43 page pamphlet ca. 1837, which is the edition from which this transcription was made. :: I've been able to find no other record of this text; my own copy is from Becquerel's library, so perhaps it was only printed in a small private edition for distribution to colleagues of the author. : Charles Cagniard-Latour (1777-1859): Mémoire sur la Fermentation vineuse. 1837(1838). : Thénard, Becquerel, Turpin: Rapport sur des observations et des expériences faites sur la cause et les effets de la fermentation vineuse; par M. Cagniard-Latour. (1838). : Pierre J.F. Turpin (1775-1840): Mémoire sur la cause et les effets de la fermentation alcoolique et acéteuse. Lu à l'Académie en sa séance de 20 août 1838. 1838(1840). : Jean-Jacques Colin (1784-1865): Nouveau Mémoire sur la Fermentation. (ca. 1837). : Louis Pasteur (1822-1895): Mémoire sur la fermentation appelée lactique. (1857); and, Mémoire sur la fermentation alcoolique (1857). 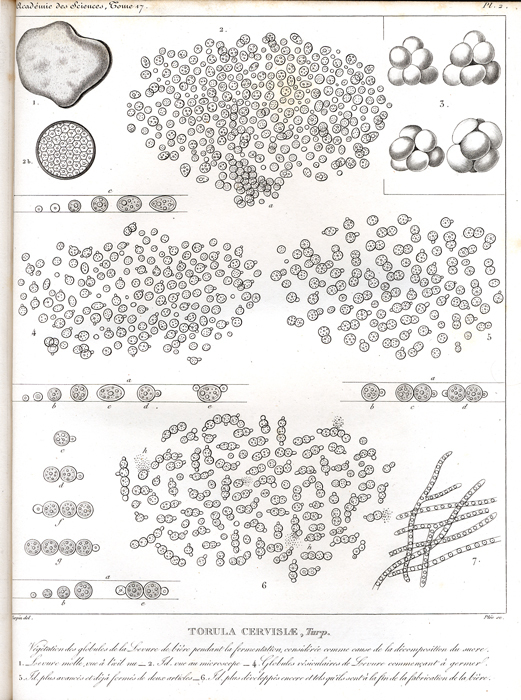 :: Turpin's drawing of microbial life as he saw it under his microscope at the Grande Brasserie du Luxembourg, that long night in October, 1837.
:: A startling Renaissance treatise on the senses, and on the delectation of pleasure by humans, beasts, and angels. :: in, Girolamo Cardano, Les livres de Hierome Cardanus medecin Milannois, intitulez de la Subtilité, & subtiles inuentions, ensemble les causes occultes, & raisons d'icelles. Traduis de Latin en Françoys, par Richard le Blanc (Paris, 1566). :: The complete wine-making instructions from the most important agricultural text of the Italian Renaissance, in its very rare first edition. 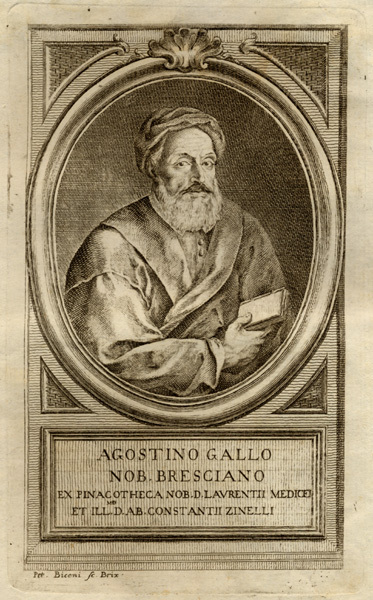 :: in, Agostino Gallo, Le Dieci Giornate della vera Agricoltura, e Piaceri della Villa, (1565?) 1566.
:: and two images to accompany the text, a portrait of Agostino Gallo, and a woodcut of his design for a wine filter. :: The earliest description of Swiss wine-making known to me, contrasted with a composite text of only some sixty years later - but an entire world apart - by members of the Société conomique de Berne. : Emanuel Koenig, Georgica Helvetica Curiosa, das ist: Neu Curioses Eydgnossisch-Schweitzerisches Hauss-Buch, Basel, 1705/6. : (unattributed) Traité complet sur la maniere de planter, d'élever et de cultiver la vigne, in 2 volumes, Yverdon, 1768. III. d'oeconomie politique, in 16 volumes, Yverdon, 1770-1.
tirés du grand Dictionnaire Encyclopédique, Lausanne, 1778.
:: An extensive excerpt from Charles Estienne & Jean Liébault's L'Agriculture et Maison Rustique, including by far the most important and detailed early description of the wines of France, added by Liébault ca. 1582 - a text also available on this site in the wonderful Elizabethan translation of Richard Surflet, The Countrey Farme. :: The earliest account known to me of the viticulture and wine-making of sherry in Xeres; by a visiting Italian, ca. 1775.
:: The first of the two earliest printed descriptions known to me of the viticulture of Bordeaux, and one of the earliest descriptions of its wines; by a Bordelais grower, ca. 1757.
:: The second of the two earliest accounts known to me of the viticulture of Bordeaux, and the earliest printed account of its wine-making; by B.L. Reboul, a visiting Provençal, ca. 1772.
:: A set of rare 19th-century texts on wine-making at Hermitage, thus called The Hermitage Anthology, emphasizing such points as, for example, the critical importance of new oak barrels. And with many more soon to come.